If you follow me on social media (and you should), you probably know I am on holiday and I’m living my best life. The part of a trip that I like the least (apart from it ending) is flying – not because I am scared or it bothers me so much, I just feel like the whole airport trip takes forever. And then there’s the aeroplane air. Not good air, I can tell you that. While I am yet to be able to afford a private jet with a beautician on board, I have developed a little skincare routine for my flights, as plane air is so dry it can leave skin dehydrated, dull and puffy. And no one wants to look tired when they step off the plane, amirite? 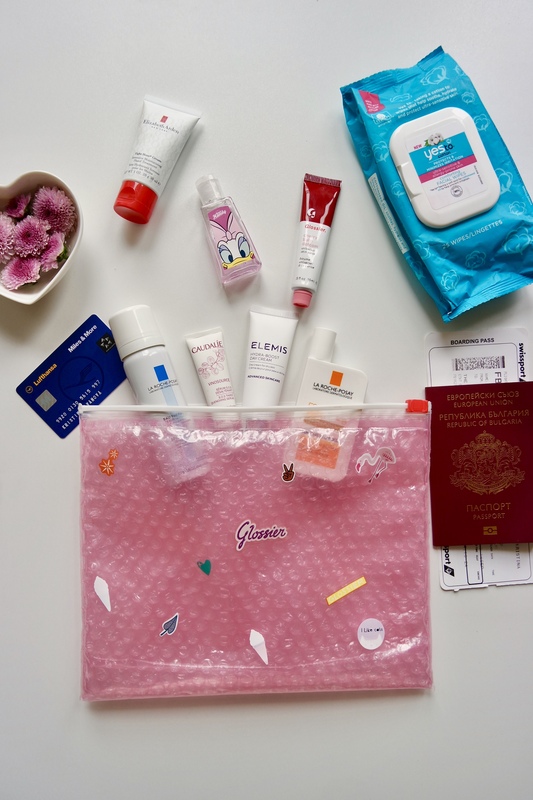 I’ve packed and then spilt my carry on essentials for glowing skin (in a Glossier pouch, ofc) all over the table for you to see, so dive in. First up is the hand sanitiser. I do wash my hands in the plane loo, but I am not sure how long the water I use has been in the tank and how clean it is, so after I do that, I use a bit of sanitiser to be sure my hands are all clean. I’m using the Merci Handy Flower Power one from their Disney Collection and my little cousins are ever so envious of it. Mine though. I am that annoying person that takes out all my products out on the little table (covered by a tissue of course) and I get on with my routine. You know I don’t do a lot of makeup, and airports and flights are no exception. I always find it bizarre when I see girls with a full face on at 5am at Stansted. What time did you get up at to do this, hun? Cause I could barely brush my teeth before I left with one eye closed and mismatched socks. Anyways, despite the fact I don’t wear makeup, I still feel I need to clean my face before getting on with my routine, and this is where the face wipes come to play. Since this is the only time I use them, a packet lasts me a long time. My current ones are from Yes To. They are the Cotton Comforting Facial Wipes, which are made of recycled cotton and are supposed to be good to your skin. I am willing to agree they are not so bad, because they don’t irritate my skin, or leave it feeling too dry. Since I would have ideally used toner in the morning, I don’t bring one on the plane with me. What I do bring, however, is a travel-sized bottle of the La Roche Posay Thermal water spray. It is better to apply skincare products on slightly damp skin so that they can be absorbed better. The spray is also super refreshing, and if you get warm you can just spritz a bit on your face and feel instantly refreshed. After I’ve been on the plane for a little while, it’s time for an SOS moisture kick with the Caudalie SOS Thirst Quenching Serum. I don’t even remember where this little friend came from, but it has been on flights with me for the past few months and my skin absorbs it like it’s never seen a serum before. It’s great! Moving on to moisturiser, I bring the Elemis Hydra-Boost day cream with me. 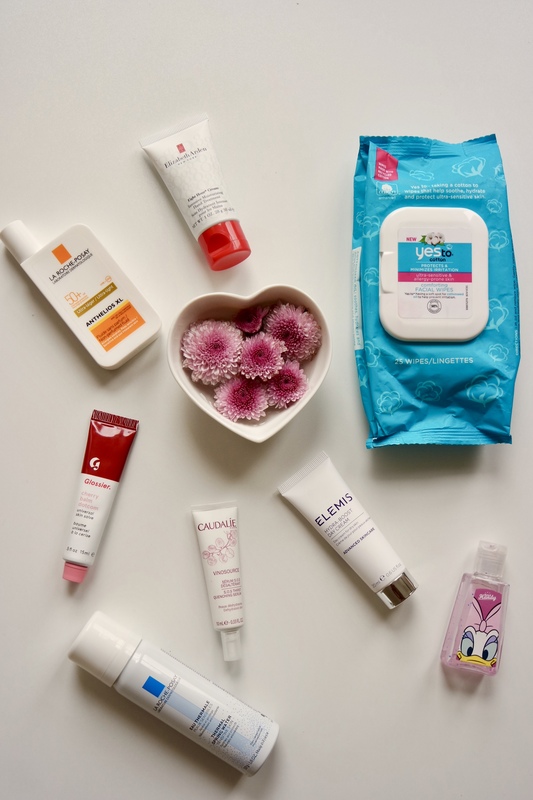 I may have a slight obsession with Elemis, which is going to get me in trouble because this stuff is pricey, but what can you do? A light hydrating face cream is a flight must-have, as you want to battle dehydration, plus it will double as my holiday moisturiser, so I’m being sensible here. As you know, (probably because I keep mentioning it) wearing sunblock is super important. What you may not know, however, is that it’s even more important on a flight, especially if you love your window seat. The tiny aeroplane window will block the UVB light so you will not burn, but the dangerous UVA lights will get through to your skin. 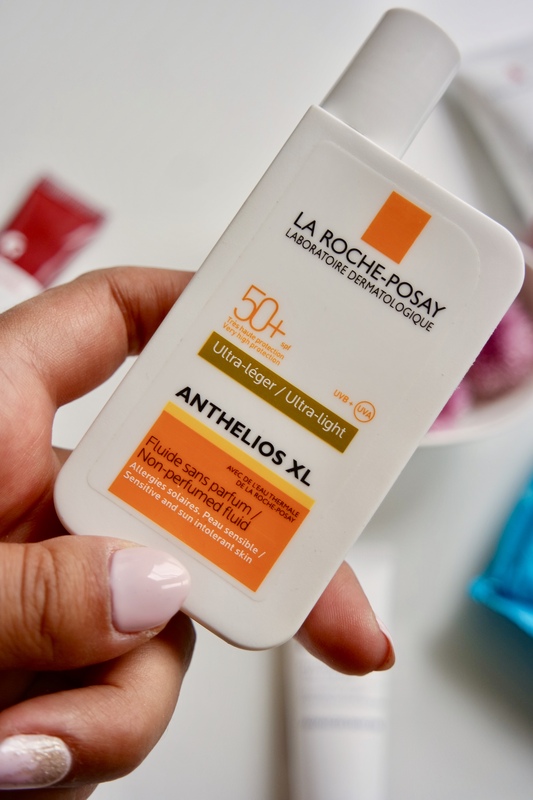 Which is why I travel with my La Roche-Posay Anthelios XL in my bag – I apply it before I leave for the airport, and after I’ve moisturised on the plane and just before I leave the airport at my final destination. 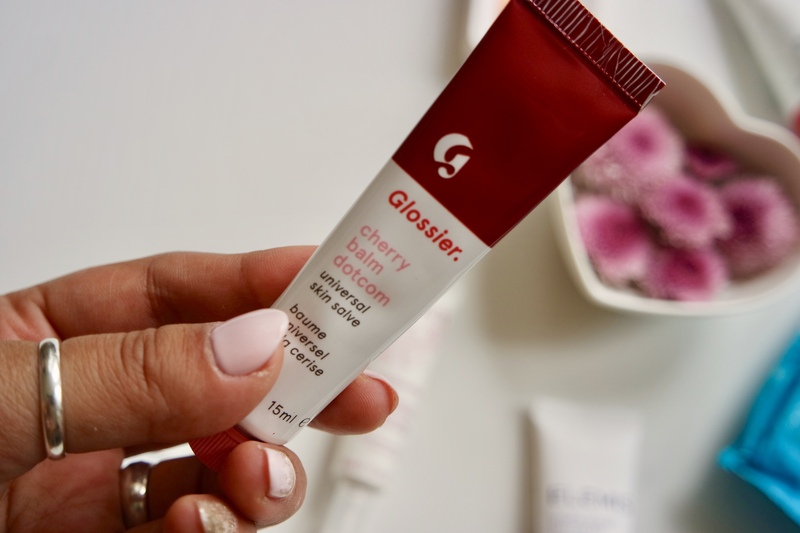 You know how much I love my Glossier balm dotcom, and I recently stocked up by buying three new ones. The one I’ve decided to take on holiday is the cherry one, as it gives a subtle sheen and smells oh so delicious. It also leaves my lips soft and ready for all the cocktails. Last, but definitely not least, is the king of hand creams – Elizabeth Arden 8 Hour cream. Often, people forget how important it is to keep the skin on their paws hydrated, but I’ve been obsessively moisturising them since I was about nine, I never leave the house without a hand cream. And this one does a brilliant job, so I always try and have one with me. If I was to go on a flight longer than three hours, I’d probably also pop a sheet mask in my pouch, but since I’m on a short flight, and I would have done one the night before, I think I can get away with not terrifying those sat next to me. And then, when I get off the plane, I go and apply a bit more sunscreen, just to be sure and get on with my day fresh-faced and ready to roll! Thanks for sharing, I actually have that same elemis product from my fab fit fun bag. Which of these products is your favorite? Wow, you sure are organized with your routine! Love it!! I really enjoyed reading this! Love the tip about the hand cream–sounds like a good one. This post will definitely inspire me to take a bit better care of myself in-flight on my next trip! Hand sanitizer, sunscreen and lip balm are definitely musts for me, too. You never know what germs are lurking, and planes seem to dry out my lips! 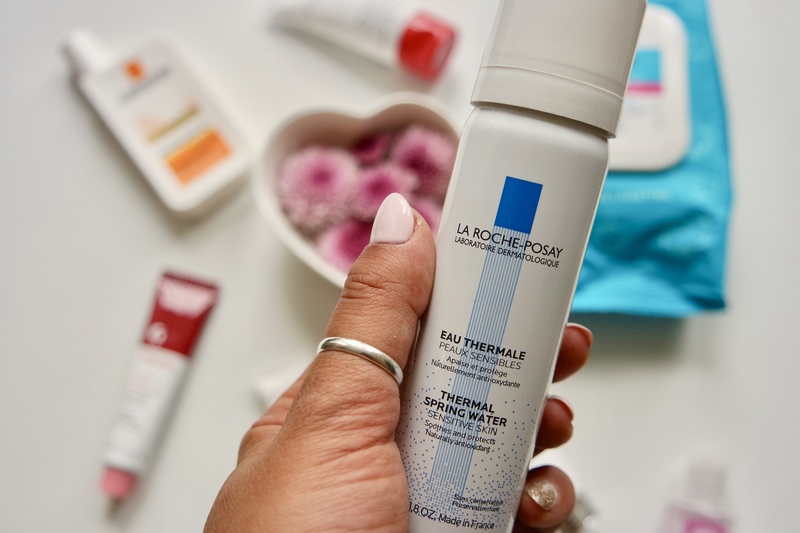 The Eau Thermale by La Roche-Posay is an absolute life saviour! Love how well organised you are! Those are really cute and great stuffs that must have when you are travelling. Thanks for sharing with us really appreciated it. Hand sanitizer is a must for me whenever I travel, all the other products are essential too for anyone who cares for their skin or travels in planes frequently, Loved the post. These are some essential stuffs to carry on while travelling. Hand sanitizer is like essential stuff for me to carry. This is a really helpful post. You picked some great items to put in your essentials for flying! Great tips for in flight skin care.Flying always tends to dry me out. If you want to add toner to your routine, Trader Joe’s sells a great rose facial toner spray that is great for travel! thanks for the tips and tricks shared. my mom and sister would love this! I always get confused about how & what I should carry during flight. Finally you cleared it. Right on, my wife will definitely be into this post, thanks for sharing!